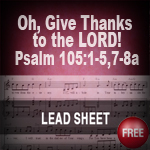 Scripture Songs for Worship : Psalm 105:1-5,7-8a Song "Oh, Give Thanks to the LORD"
Psalm 105:1-5,7-8a Song "Oh, Give Thanks to the LORD"
Music and Video Copyrighted 2014 by Esther Mui. 8a He remembers His covenant forever. May Our God bless you and continue to direct your path according to His purposes!